President Trump appears at a campaign rally in Wilkes-Barre for U.S. Rep. Lou Barletta, the Hazleton Republican trying to defeat Sen. Bob Casey. WILKES-BARRE — President Trump returned to Northeast Pennsylvania on Thursday night to savor his 2016 victory, rehash familiar grievances with the "fake news" that he says refuses to credit his successes, and to stump for U.S. Rep. Lou Barletta, the Hazleton Republican trying to defeat Sen. Bob Casey. "We are respected again," Trump told a largely adoring crowd, boasting of a booming economy and a nation standing up for its workers against unfair foreign trade. "The forgotten men and women of the United States are forgotten no more." Trump visits the county that helped swing Pa. to the right. Can Democrats win it back? His roughly 76-minute rally followed what has been a pattern for the president: As the criticism and the Washington investigations and the White House infighting ramp up, Trump reverts to campaign mode and retreats to the base that sustains him. 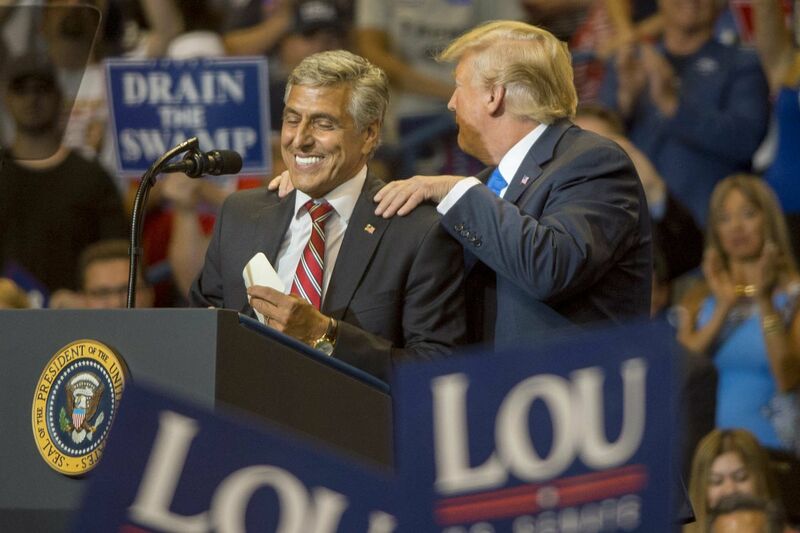 President Trump appears at a campaign rally for U.S. Rep. Lou Barletta at the Mohegan Sun Arena in Wilkes-Barre August 2, 2018. And so it was in the heart of Luzerne County, one of the places that helped him win the White House two years ago — and one seen as a possible bellwether for his party's chances in the midterm elections. Before thousands in a hockey arena, Trump revisited familiar themes in his usual stream-of-consciousness style, including his demand for a border wall and other efforts to stem illegal immigration, the issue that helped boost Barletta's own political rise. The Wall? "We're building it," Trump insisted. "And we're going to start getting very nasty about it." He also called for a bigger border patrol force instead of more immigration judges to hear asylum claims. "It's our country, so get the hell out," he said. Hillary Clinton, his target during the 2016 race, made a return rhetorical appearance. "Lock her up!" the crowd chanted. Trump also challenged the accounts of his international diplomatic efforts, denying he had treated Queen Elizabeth II of Britain rudely, and pronouncing his summit meeting with Russian leader Vladimir Putin last week a success. "We discussed everything. We got along really well. By the way, that's a good thing, not a bad thing," Trump said. And he repeated his declaration that the investigation by special counsel Robert Mueller into his campaign's dealings with Russia was a "hoax." Most drew a cheer, a knowing nod, or a roar of approval from the crowd. In a tweet, Barletta estimated 11,000 filled the arena, with 2,000 outside. A single protester removed early in the rally drew jeers and a sea of extended middle fingers. But the vast majority were dedicated supporters of the president. Chris and Catalina Fields came from Kingston eager to hear about Trump's stance on immigration. Chris Fields, 59, said it took his 34-year-old wife four years to legally enter the U.S. from the Philippines. "Illegals come here day after day. [We] did it the right way," he said. Robert Pagotto, 73, of Elmhurst Township, Lackawanna County, checks his phone while he waits in line to see President Trump at a campaign rally for U.S. Rep. Lou Barletta at the Mohegan Sun Arena in Wilkes-Barre on Thursday, Aug. 2, 2018. The working-class county was pivotal to Trump's success in becoming the first GOP presidential nominee to win Pennsylvania in nearly three decades. He defeated Clinton there by 26,000 votes, a swing of more than 30,000 votes from President Barack Obama's winning margin there four years earlier. Both at the beginning and the end of the rally, the president urged the crowd to vote for Barletta, the congressman and onetime Hazleton mayor who was one of his most ardent Pennsylvania supporters in 2016. Barletta is trailing Casey both in the polls and campaign fund-raising. At one point, the president ceded his microphone to the congressman, with Barletta bounding on the stage to shouts of "Louuuuu!" "Now listen, this seat is very important, because we want to keep this economy going," Barletta said of his race against Casey in the closely divided Senate. "We're not tired of winning. … Help me help President Trump make America great again." In one of the few original lines of the night, Trump appeared to coin an impromptu nickname for Casey –"Sleepin' Bob," he called him — that delighted the crowd. The president said he knew and liked Casey's father — whose name is on the development that includes the hockey arena. Thomas Musolino of Hazleton wears a Trump mask as he and daughter Gianna, 10, wait for the President to arrive. But Trump said the younger Casey was "boring," a nobody in Washington who does what Democratic leaders tell him. "I don't think I ever met him," Trump said. Don Evans, wearing a U.S. flag bandanna around his neck, was among the faithful who arrived hours early for the 7 p.m. event. Evans said he's never voted or been to a political rally. But he's passionate about controlling immigration and wants Trump to build the promised wall on the border with Mexico. "I'd put the first brick down," Evans, 66, said. He also said he can't wait to vote for the first time — to reelect Trump. "If [the election] were tomorrow, I'd be first in line," he said. Trump supporter Nicholas Haas, 22, of Dalton poses in front of protesters outside the entrance to where President Trump was to appear at a campaign rally for U.S. Rep. Lou Barletta at the Mohegan Sun Arena in Wilkes-Barre. "What I really like is how he is a bit more controversial," said Tim Mikolaichik, 18, of Mountaintop, wearing a red Make America Great Again cap and a NASCAR T-shirt. "He's not afraid to share his opinion," Mikolaichik said. "He says and does what he wants. I like how he's not bound by any party." David Alberola of Nanticoke brought his service dog, Lucky, to the rally. "I think he's one of our nation's greatest leaders," Alberola said of the president. "It's just amazing what he's done so far in under two years." David Alberola of Nanticoke said his service dog Lucky was excited to attend his first Trump rally. While some congressional Republicans have expressed concerns or misgivings about many of Trump's recent moves on issues such as separating children from parents who cross into the country, tariffs on imports and exports, and a threatened government shutdown just before the Nov. 6 election, Barletta has been a reliable ally. My advice to media re: out of control Trump driven crowd hostility at his rallies; boycott them. Send in an AP pool reporter and AP pool photog. Nothing more. Take away his oxygen for a while. Barletta's campaign sees the president as key to reigniting the passion that shook the state in 2016. Casey, too, wants Trump and Barletta joined at the hip; he sees the president as an anchor for the challenger. Hometown friends from Williamsport wear their opinion of the news media on their shirts as they wait in line to see President Trump. Trump was scheduled to attend a fund-raiser for Barletta before the rally, following a fund-raiser headlined by Vice President Pence in Philadelphia last week. The GOP line of attack, outlined by Pence last week: Once a sensible moderate, Casey has lurched left, opposing tax cuts, the repeal of the Affordable Care Act, and efforts to take federal funds from so-called sanctuary cities that resist reporting some information about undocumented people. "He's a dyed-in-the-wool progressive who wants open borders, socialism, and sanctuary cities," Republican state chairman Val DiGiorgio told the crowd awaiting the president. "Bob Casey has become a rank-and-file member of the Nancy Pelosi-Elizabeth Warren wing of the Democrat Party." Casey did not sound rattled in an earlier interview. "If that's his strategy, I hope he sticks with it," Casey said. "To the extent that someone buys into that, they're probably already there, they're probably already against me. It's just the nature of politics today." Trump reelection supporters wait inside the Mohegan Sun Arena in Wilkes-Barre.